Hellen Mary Akiror's livelihood relies on the right amount of rainfall coming at the right time. A farmer in Uganda's Soroti district, Hellen lives with her husband and seven children. Growing millet, groundnuts, sorghum, cassava and potatoes on her four acres, she is dependent on rain-fed agriculture for her survival. Yet, she said, "Rainfall comes at the wrong time, in huge quantities and stops when we need it most." Hellen's story is all too common. In 2014, I met Mukasa, an elderly Ugandan farmer grappling with the fact that his village was facing unpredictable rainfall and temperatures higher than any in living memory. At the same focus group discussion where I met Mukasa, I also met Father Philippe, the pastor of Mukasa's parish. Father Philippe said, "We have sinned and the lack of rain and excess heat are the wrath of God." Another parish member said, "We destroyed the trees and we are facing the consequences." While the villagers' explanations vary, all agree on one point -- rainfall in the country is becoming scarce and unpredictable, and extreme heat is increasing in intensity and frequency. During the 80 years between 1911 and 1990, only eight droughts occurred, while in the 10 years between 1991 and 2000, the country experienced seven droughts. As in other sub-Saharan countries, higher temperatures and more frequent and severe droughts and floods in Uganda diminish food security, decrease the quantity and quality of water, and deteriorate natural resources. As a research scientist in climate change adaptation and resilience, I hear many stories about the challenges of farming in Uganda. A farmer in the Nakasongola district told me that the farmers used to know when to plant and what to plant to expect a good harvest because they knew when rainfall would begin and end. Nowadays, the farmer said, "Rainfall comes and ends haphazardly, and we do not know whether we will survive one year to the next." The Climate Change Adaptation and ICT (CHAI) project was built with these human stakes in mind. 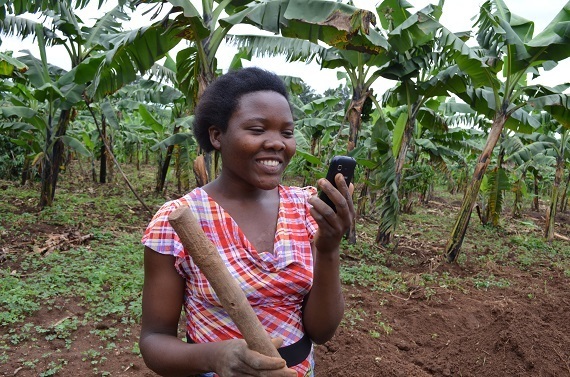 Using information and communication technology (ICT) tools in local languages, CHAI uses interactive FM-radio broadcast, mobile phones (text messaging and interactive voice response), email and face-to-face meetings to help farmers adapt and communities thrive. Hyper-local seasonal weather forecasts, livestock and crop market data, and guidance on drought and flood coping mechanisms help farmers decide what, when, where and how much to produce and sell. The CHAI project provides Hellen, and more than 120,000 farmers in Uganda, with a new means of receiving adaptation information and tools to protect her family's well-being. She receives forecasts on her mobile phone two to three weeks before each season commences. The forecasts include advisories about how to prepare for imminent dry spells and how to build small, low-cost water harvesting structures. "Since I started getting messages from CHAI," says Hellen, "I know which crops I am supposed to plant and at what time." She has learned about early-maturing and drought-resistant crops. "These messages have really helped me," she says. "In addition to receiving information on how to cope with water problems, I also listen to monthly radio talk shows on Etop radio and weekly radio broadcasts that share more detailed information than what I receive on my phone." Hellen also receives weekly livestock and crop prices at 10 market outlets in the Soroti district and insight into who in the district can provide additional assistance. I am a firm believer that this technology has the potential to strengthen resilience, avert future famine, build food security and reduce Africa's US$40 billion annual agricultural imports. Rigorous research performed by FHI 360 and Ugandan researchers showed that farmers who acted on information received through CHAI minimized crop loss and damage by up to 65 percent. But for farmers, their families and their communities, this technology holds much more than the promise of economic savings: It could save their very livelihoods. The CHAI project won the United Nations Framework Convention on Climate Change (UNFCCC) Momentum for Change award as one of 16 global game-changing climate action initiatives and was honored at the 2015 UNFCCC Conference in Paris. The CHAI project is a partnership between FHI 360, Uganda HealthNet, Uganda's Ministry of Water and Environment (Climate Change Department, National Meteorological Authority, and Wetlands Management), Makerere University's Zoology Department and College of Agricultural and Environmental Sciences, and the International Development Research Centre, Canada (IDRC). 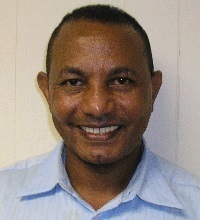 Berhane Gebru, Director of Programs, TechLab, FHI 360, is an accomplished leader of ICT projects which support health and environment programs around the world. He has successfully led the deployment of several mobile technology-based projects: implementation of a unique wireless telecommunication system and mobile devices to collect and analyze health management information data and dissemination of clinical information to healthcare providers in Uganda; a digital integrated disease surveillance and response system for nationwide use in Mozambique; and GPS, image, enrollment, and other basic data sets from schools in South Sudan for the National Education Management Information System. Mr. Gebru also led the Mobile Health Information System project in South Africa, demonstrating that clinicians could use a Mobile Health Library on mobile phones and 3G connectivity to access health information and provide better patient care. Mr. Gebru has managed projects in Rwanda, Ethiopia, Mozambique, South Africa, South Sudan, Botswana, Malawi, Bangladesh, Nepal, Kenya, Swaziland, Thailand, Nigeria, Bolivia, Papua New Guinea, Ghana, Uganda, Afghanistan and Zambia that involved the design, development and delivery of technical support and training to in-country teams and users. Prior assignments include serving as the Deputy Director of the Relief Society of Tigray, the largest local NGO in Ethiopia, for which he oversaw dozens of bilateral and multilateral development projects related to health, food security, water supply and sanitation and the environment.